On June 28th, 2012, Nansen Dialogue Centre Skopje in partnership with the Ministry for Education and Science marked the opening of the first “Training Center for Integrated Education” in Macedonia. 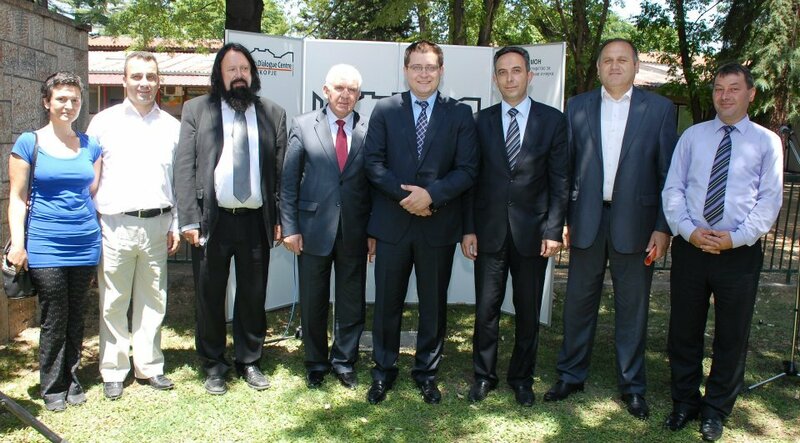 The event was attended by the Minister for Education and Science – Pance Kralev, the Minister without portfolio – Hadi Nezir, Deputy Minister for Education and Science – Safet Neziri, the mayor of Vasilevo Municipality – Vanco Stojanov, the mayor of Petrovec Municipality – Borce Mitevski, the director of the Nansen Dilaogue Network – Steinar Bryn, the directors of the education depatrment within the local municipalities of Cair and Strumica, the directors of the scools that implement the Nansen model for integrated eduxcation as well as many teachers and professors. The Minister for Education and Science stressed the importance and the necessity of offering institutional support to NDC Skopje during the implementation of all program activities. The Taining Center for Integrated education will offer theoretical and practical training on the Nansen model for integrated education that will enable all the implementers and promoters of the model to get acquainted with the characteristics, acquisitions and benefits of this model of education as well as gain the necessary skills for the direct implementation in the schools with multi ethnic structure of students. According to the initial plan of NDC Skopje and the Ministry for Education and Science of R. of Macedonia, during the upcoming three years the trainings will be attended by nearly 150 teachers. The structure of the trainings that will be held in this Training Center is 60% theory and 40% practical work. The theoretical part will be realized within the Training Center facilities whereas the practical part will be held in two model school that will be additionally equipped for this purpose. The Executive Director of NDC Skopje – Sasho Stojkovski gave an overwiew of the efforts taken by NDC Skopje and the time and experience needed to establsih Nansen model for intergrated education in R. of Macedonia. The project Nansen model for integrated education including the Training Center is financially supported from the Ministry for Foreign Affairs of the Kingdom of Norway, and starting from this year, financial support will be also given by the Government of Macedonia respectively from the Ministry for Education and Science.